So while I was at the firing, I had a bunch of fun, once again, with the video features of my canon sd850. The first bits to be processed and uploaded are some time lapse videos of loading the kiln. The process of loading a kiln ends up being pretty slow and complex. I’m writing up an explanation of all the factors that go into that slowness, but decided to put them in a separate post. For now, you can enjoy the process of loading a kiln at x30 speed and set to fun music. It’s pretty fascinating, really. Loading a kiln, from the inside: This video is shot from one of the stoke holes, and follows the loading of the shelf after the middle firebox. Since it’s so close to the middle firebox, where we’ll be putting in sidestoking wood, we’re being careful not to put anything small on the back side of the shelf that might get knocked over. It’s about 3 hours boiled down to 5 minutes. Loading a Kiln, from the outside: This video is of loading the next set of two shelves, but shot from outside of the kiln entrance. It really shows a different aspect of the process. For every person in the kiln there’s another few outside, prepping the pots, organizing, discussing, shooting the breeze, and just hanging around. It covers about 2 hours in 4 minutes. I’ve just discovered you can watch these in higher quality, but only on the Youtube website. So follow them back to their youtube pages for a less grainy version. As the title suggests, I’m back from the wood firing! It went quite well. We went for around 110 hours including reduction cooling. We decided to keep the kiln a little cooler this time, and topped out at 2380°f in front, and about 2360°f in back. We dropped cone 13 in front, (ceramics measures firings in cones, something I’ll explain at another time) and reached cone 12 or so in the middle and back. In the past couple firings we’ve hit 2450°f, and dropped cone 14, but decided that was a bit hot for the results we were looking for. This firing, the front of the kiln was loaded far looser than we’ve ever had it, while the back was very tight. It will be interesting to see how this effects the results. The firing was very even in temperature, and so many of the pieces looked positively juicy with melted ash. I hope it comes out well, but I’ll have to wait a week to find out. There will be a lot of fun videos and pictures appearing in the next few days, so stay tuned! I’ve been really busy in the past few weeks, getting ready for a big wood firing at Santatsugama. Santatsugama (3 dragon kiln) is the anagama style wood kiln in Seabeck, WA where I regularly fire. We fire 4 times a year, so I need to have all of my work for the next four months ready to go by this Saturday. As you can imagine, this leads to some long days and late nights in the studio before the firing. However, at this point, everything that can be finished is finished, and there’s finally nothing left for me to do. All of my work is in the bisque kiln now, and I won’t be able to touch it until Friday when I pack it up for the drive to the wood kiln. This means I’m finally free for a day or two, even if it means I have to get caught up on stuff I missed while I was in the studio. We’re planning on following our normal schedule for this firing, which is to spend Saturday and Sunday loading, and then fire up the kiln at midnight Sunday night. We’ll continue for 150 (+/-5) hours straight, finishing up Friday. I’ll write up a whole post explaining wood fire at some point, but in the mean time, this flickr set should be able give you an idea of what it’s like. Also, here’s a sneak peek of what’s going into the kiln. Once I’m back from the firing, I’ll be uploading many more pictures of these guys, including some more timelapse videos. And yes, the guy in the bottom right is City Beast 2.0, who starred in the first timelapse video. Pretty exciting! I broke my camera (a Canon SD700) a bit ago and replaced it with a SD850. It’s the exact same camera, but with more megapixels, and, as I discovered, a time lapse video mode. I’m pretty excited about this, and have been making timelapse videos of making sculptures. This is my first one. This is the process of putting teeth into a big guy that I was making. He’s since turned into CityBeast 2.0, a bigger and more elaborate version of an earlier sculpture. The video covers a hour and forty minutes, as I make the teeth, arrange them, and then secure them. Following is my second video experiment. That was just just put together with the tools I had on hand (Windows Movie Maker). I’m not completely happy with the captioning, but it’s still pretty fun, all in all. I’ve since had time to follow some creatures from start to finish with the camera. I just need to sort the video and put it together, which I’ll hope to do sometime in the next few weeks. You can be sure that it will be here once it’s done! As part of the website redesign, I decided to start up a blog. It’s something I’d been talking about for a bit. I’ve been spending so much time putting together explanations of the ceramics process for friends and family that I thought it might be fun to share them with anyone who might be interested. 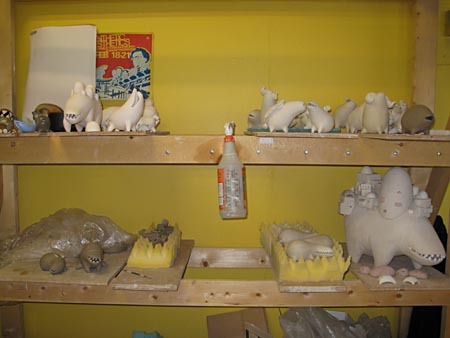 The primary goal of the blog will be to explain ceramics, from the my processes to the culture in general. However, I expect it to meander a fair bit along the way. So regardless of its final form, I hope you enjoy these musings on clay, life, and whatever happens to be distracting me at the moment.